Recounting the tender, dynamic and familiar story of the parent-child relationship, Hesston College Theatre will present five performances of the musical Big Fish, Feb. 27 to March 3, in the Hesston College Keim Center Black Box Theatre. Showtimes are at 7 p.m., Feb. 27 to March 2, and 2 p.m., on Sunday, March 3. Tickets are $10 for adults and seniors and $5 for students. Purchasing tickets in advance is recommended as seating is limited. Tickets can be purchased online at hesston.edu/big-fish-tix or at the Hesston College Bookstore in Erb Hall during regular business hours or by calling 620-327-8105. 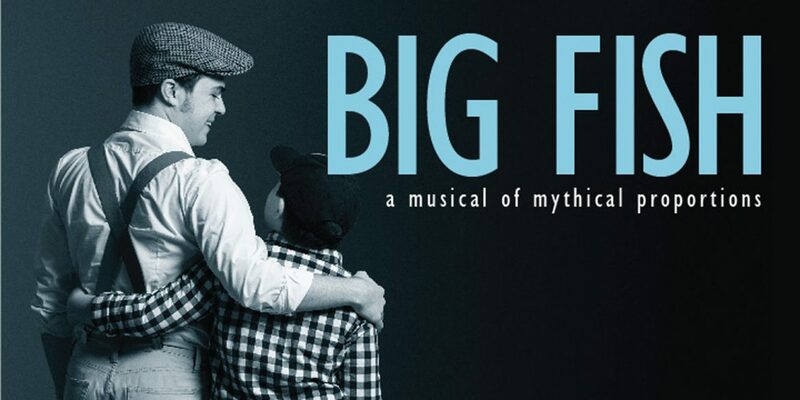 Big Fish is a family-friendly musical for all ages. Big Fish tells the story of Edward Bloom, a man in failing health, and his son, Will, who doesn’t believe the larger-than-life stories his father recounts of his extraordinary life. As Edward continues to decline, Will tries to find the truth behind the tall tales, putting a strain on their relationship. Will must decide to accept his father’s stories or risk losing him completely. Written by John August with music by Andrew Lippa, Big Fish is adapted from the 1998 novel Big Fish: A Novel of Mythic Proportions by Daniel Wallace, and the 2003 movie adaptation of the same name. Jantzi notes that with its traditional style, Big Fish carries a different feel than many of her past Hesston College productions, and also creates more spectacle. The lead character, Edward, played by sophomore Therin Smith (Key West, Fla.) moves seamlessly between past and present time periods. The role of Will as a grown man who is anticipating the birth of his first child, is played by freshman Tanner DeGrado (Newton, Kan.), and sophomore Leah Huyard (Harrisonburg, Va.) plays Edward’s steadfast wife, Sandra. Making his theatre debut in the role of Will as a child is 10-year-old community student, Alex Gale.